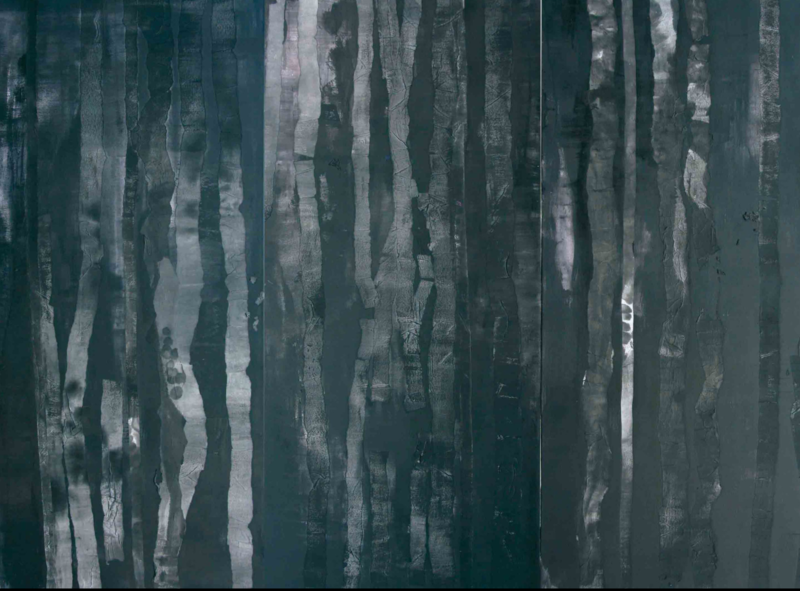 The painting “Second Nature” by the contemporary Uyghur artist Nijat Hushur, above, reflects the feelings of loneliness and separation he experienced when he began the process of seeking asylum in Sweden, apart from his wife and children. The horrifying stories of pain and suffering in internment camps filtering out from the Uyghur homeland have filled Uyghurs around the world with a deep sorrow. The Uyghur poet Muyesser Abdulehed said she could not help but imagine being one of the million who have spent time in these camps. The guilt of having escaped and survived is sometimes overwhelming. Many Uyghurs that I have become close to over the years have told me that survivor’s guilt invades their dreams and takes away the small joys in their lives. For many, these feelings of guilt, anger, sorrow, and fear coalesced during the uncertain rumors of folk musician and poet Abdurehim Heyit’s death — and his subsequent appearance in a forced video testimony. Uyghurs around the world took to social media to publicly demand the Chinese state release videos of their relatives to show that they too remain alive. They asked non-Uyghur allies to join them by posting images with handwritten signs with the hashtag #MeTooUyghur — an expression of sharing in the pain of Uyghur suffering. 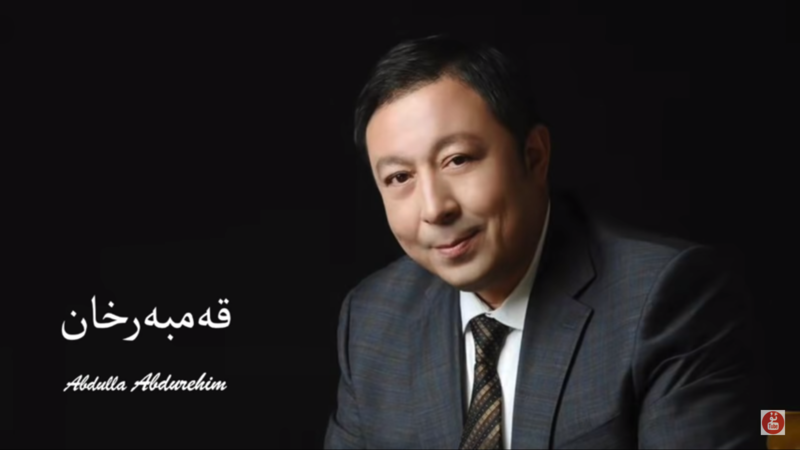 “I am under investigation,” says detained Uyghur folk singer Abdurehim Heyit in the above video. An anonymous art collective produced a series of images that centered around the silencing of Abdurehim Heyit, but also strove to represent the disappearances of hundreds of poets, musicians, and public intellectuals. This “eliticide,” as it was named recently by Henryk Szadziewski, makes clear that the Chinese state’s efforts to re-engineer Uyghur society is not simply focused on religious extremism or counter-terrorism, but in silencing and eliminating Uyghur cultural thought. Three recent poems, selected by the San Francisco-based poetry translator Sübhi, herself a Uyghur-in-exile, attempt to put words and images to these feelings of symbolic violence. They show us the way this cultural violence is connected to material, everyday forms of violence and ultimately a kind of structural violence that is shattering the Uyghur world. Abdurehim Heyit, as portrayed by the anonymous art collective Sulu.ArtCo. On Heyit’s jacket is the lyrics of one of his most famous folk songs, “The Encounter” (Uy: Uchrashqanda). The song tells the story of a young woman who fights to survive in the face of death. The collective has also generated iconic #MeTooUyghur images of dozens of other Uyghur public figures who have been disappeared. For Abdulehed, who writes poetry under the pen name Hendan, these recent events reawakened a desire to “go back and suffer with my people.” She told me that, “It is more difficult to be safe yet unable to do anything helpful for them. It was then that I had the profound realization that being dead in one’s own land is better than being alive with a strangled soul.” Abdulehed, who now lives in Turkey, lost contact with most of her relatives in 2017. The feelings of depression and loneliness have driven her to think about the meaninglessness of life. It has also pushed her to write poems about her feelings. This poem, which centers around the image of the fire, is rooted in Sufi poetics that is central to Uyghur poetry traditions. Hendan’s love for the bright white soil of her homeland is enticing her to sacrifice her life for her beloved. She is like a moth attracted to flame. She is on the verge of no longer caring if she lives or dies, as long as she is able to run to the tomb of her mother. She just wants the pain to stop and her body to no longer be strangled by grief. As she notes at the end of the poem, her response to the rumors of Abdurehim Heyit’s death is that death is impossible if one is at home. Like many of the Uyghurs living in exile whose relatives have disappeared into the vast internment camp system for Uyghur, Kazak, and other Muslims in northwest China, Muhemet has turned his longing into poetry. Uyghurs have a vibrant poetry tradition. Until the recent “re-education” effort which seeks to diminish, and in some cases, eliminate Uyghur-language publishing, there were hundreds of poetry journals across the Uyghur homeland. Nearly all Uyghur adults can recite poems by heart and many have authored their own poems. Another Uyghur poet, Abduweli Ayup, who currently lives in exile in Turkey, said he grew up near the shrine for the famous 11th-century scholar Mahmud Kashgari. In his village it seemed like everyone recited poetry. He said they “embraced poetry as a part of their lives.” He said that as a youth he memorized and recited a poem that had nearly 12,000 words, nearly 30 pages. Throughout his life, in moments of crisis, he has turned to poetry as a way of making sense of his feelings and finding a way forward. This article first appeared in SupChina on March 6, 2019. 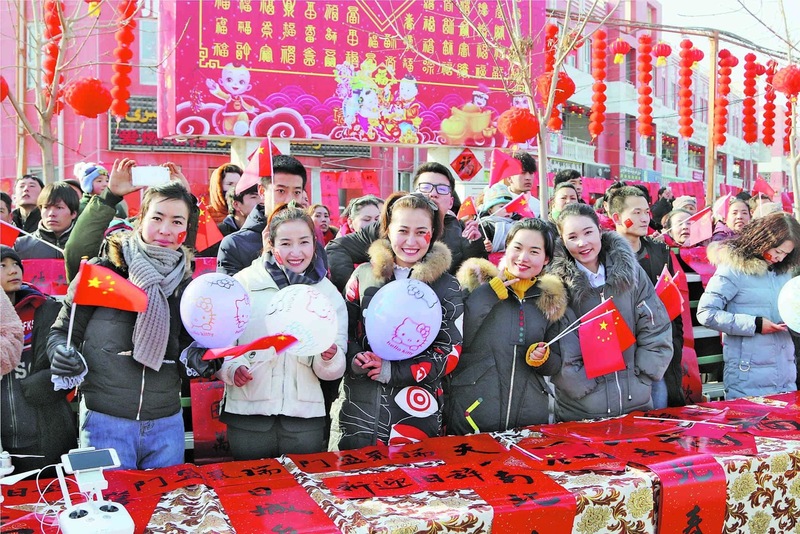 Young Han and Uyghur people celebrate the year of the pig in the town of Kucha in the southern part of the Uyghur autonomous region on January 28, 2019. The Chinese version of the lunar new year came early for Uyghurs in 2019. In mid-January, Uyghurs were asked to begin to write couplets describing their hopes and dreams for the year of the pig. They began practicing their lion and dragon dances. In an unverified screenshot, a Uyghur government official made a public display of dividing up pork and distributing it among villagers near the Muslim-majority town of Ghulja in celebration of the coming year. Many Uyghurs in the diaspora who I spoke with fear that the “pig” in the year of the pig will be all too literal: that this will be the year when Uyghurs in their homeland will be forced to eat pork as yet another way to perform Han-ness, along with being forced to shave off their mustaches. Many elderly Uyghurs have told me that one of the most psychologically damaging aspects of the Cultural Revolution was the way the Chinese Communist Party used pigs. Tumaris said, “They asked many Uyghur families, including my grandpa, to take care of pigs, to sleep in the same pen as the pigs. They made them refer to pigs as ‘political animals’ (Uy: siyasi haywan) that would teach them how to be ‘red.’ When I was a kid, many people told me stories of Uyghurs being forced to eat pork during those years, and subsequently how they went crazy.” Now, it appears as though history is repeating itself. In October 2018, images of a Uyghur farmer raising pigs as part of a state-mandated poverty alleviation project circulated widely in the Uyghur community. Tumaris and many other Uyghurs I spoke with fear that 2019 will bring even more of this symbolic violence. The canceling of Uyghur sacred holidays, like prohibitions on halal food, has a historical precedent. During the height of the Maoist era in the 1950s and 1960s, all Uyghur traditions associated with Islam were labeled counter-revolutionary. But at that time, all traditional holidays, both Han and Uyghur, were canceled. Celebrating Han cultural traditions such as the lunar new year was also associated with the Four Olds: old ideas, old culture, old customs, and old habits. Instead, people were directed to celebrate events associated with the founding of the socialist nation. They attended dance performances of the eight model revolutionary operas chosen by Jiang Qing, the wife of Chairman Mao Zedong. Uyghurs, too, celebrated these operas. They carefully translated the lyrics into Uyghur and performed them to the classical Sufi Islamic melodies of Uyghur muqam. At the time, the state believed that Uyghur cultural traditions could also become socialist traditions. This appears to no longer be the case. The transformation of Uyghur society now centers on the replacement of Uyghur cultural traditions, not with socialist rituals but with Han cultural traditions. A Uyghur performance of the Maoist model opera Raise the Red Lantern, sung in Uyghur to the tune of a classical Uyghur Sufi melody. A quintessential example of this new shift in Uyghur cultural performance was on display on Saturday, January 19, 2019 in Mekit County in rural Kashgar prefecture. At a harvest festival performance that was nationally televised on CCTV-7, Uyghur singers and dancers performed for a crowded concert hall filled with mostly Han state workers, many of whom had moved to the county to oversee the many facets of Uyghur re-education. For example, some of them may be employed by the large 15,000-square-meter internment camp — the size of a city block in Manhattan — that was built in Mekit in 2017. 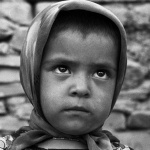 The county has a population of around 250,000 people, more than 95 percent of whom are Uyghur. Over the past two years, Mekit authorities have hired hundreds of state employees to work in the re-education system. The advertisements for these recruitment efforts target politically-motivated, Han high school graduates with a relatively high salary of 5,600 to 8,000 yuan per month and subsidized housing. The CCTV-7 gala was an effort to lift the morale of the troops on the front lines of the Uyghur re-education effort. It was also a chance for re-education workers to show the country how successful they had been in retraining Uyghurs through the nationwide broadcast. CCTV-7 performance in Mekit County, rural Kashgar prefecture. For Uyghur viewers, what was striking about the gala was the way Uyghur language was spoken for only two minutes over the course of the 74-minute performance. In general, the Uyghur performers, ranging from children to classically-trained opera singers, evoked a Mekit County that was suffused with Beijing opera, Henan-style Yu opera, and Er Ren Zhuan northeastern China-style two-person performances. Uyghur culture had been replaced by the diversity of Han cultural practices that re-educators had brought with them from eastern China. The audience of internment camp workers, Mandarin-language instructors, police, and other government employees were thrilled. A through-line of the performance was Uyghur folk painting. This painting medium is a Maoist cultural aesthetic that has been used throughout the history of the Chinese settlement of the Uyghur region since the 1950s. Up until the beginning of the “People’s War on Terror” in 2014, the paintings had been primarily a way of imagining in visual form the state narrative of socialist progress, happy Uyghurs, and inter-ethnic harmony. Then, as the state turned toward transforming Uyghur society, the message in the paintings turned to representations of terrorism and religious extremism. The paintings on display in the gala featured none of that dark violence. Instead, they featured Uyghurs enjoying a shared life with the recently arrived Han education workers. The Uyghur life that was on display was a new post-Han-fear aesthetic. The “three evil forces” had been locked up and hidden in the local camp. The new images were of Uyghurs dancing with Han. Those on stage were permitted to perform in Uyghur for one minute. But the performance was no longer a sacred Sufi ritual of ecstatic music and dance; instead, to the delight of the audience, the performance was co-opted by Henan-style Yu opera sung by a Uyghur performer named Reyhangul Kuwan after the opening minute, to the accompaniment of the retrained Dolan muqam ensemble. Then, one minute later, the re-education of the Dolan ensemble completed, Han audience members enacted the scene in the painting by coming on stage and dancing with the Uyghur performers. The Uyghur singer Reyhangul Kuwan performing a Henan-style Yu opera song in the middle of a sacred Dolan Sufi dance performance. Unlike during the Cultural Revolution, when state culture products such as the model operas could be translated and performed in a Uyghur style, in the new atmosphere of Uyghur re-education, Uyghur performers are increasingly pushed to enact a newfound Han-ness. Uyghur children emerged on stage singing Beijing opera and patriotic songs. Aside from a few moments of reflecting on local Mekit-style forms of Uyghur cuisine, such as roasted fish and lamb, and colorful Uyghur-style costumes worn by some of the Uyghur performers, the performance enacted a post-Uyghur cultural aesthetic. It was a display of the success of the Xinjiang re-education system. Abdulla Abdurehim soon after he shaved off his mustache in 2018. Sometime in 2018, the famous Uyghur musician Abdulla Abdurehim shaved off his iconic mustache. Since for Uyghurs mustaches are an essential marker of masculinity, his shaving was seen as a symbol of the emasculation of Uyghur men. Now most Uyghur men under the age of 65 no longer have facial hair, and the Uyghurs on stage at the gala were no exception. The only facial hair on display was on the faces of two elderly Dolan musicians seen in the video’s 25th minute. Abdulla’s missing mustache recalls a short story called “The Mustache Dispute,” written by the great Uyghur author Memetimin Hoshur. In the story, which the author implies is set during the Maoist period when much of Uyghur life was politicized, the protagonist is forced to shave his mustache in order to avoid detention. In the end, the matter is resolved and the men that populate the story are able to regain their manhood, aside from the village boss, who is not able to grow a mustache (the author implies he is Han). The re-education workers who cheer the re-education of Uyghurs in Mekit — and the Uyghur officials who urge their fellow Uyghurs to eat pork — are there to make sure that Uyghur masculinity, and the cultural vitality (and virility) it symbolizes, does not reappear. This article first appeared in SupChina on February 6, 2019. On October 27, 2018, Memtimin Ubul, a Communist Party deputy secretary of Kashgar’s Qaghaliq County, stated publicly something that had increasingly become the norm over the past two years in the Uyghur homeland. In the Xinjiang Uyghur Autonomous Region, it was now officially unpatriotic for Uyghur state employees to speak or write in Uyghur language. In a statement that was circulated to more than 750,000 readers, the ethnically Uyghur state official wrote that any state employee who spoke Uyghur in public “should be classified as a ‘two-faced person.’” This is a charge that has resulted in the detention of hundreds, if not thousands, of Uyghur public figures, in addition to the untold number (possibly more than a million) who have been sent to “transformation through education” prison camps. Memtimin wrote that the patriotic duty of state employees extended throughout all aspects of their lives. Patriotism should be present in the way they dressed, talked, and ate. Even in one’s home life, Uyghurs should refuse to speak Uyghur and instead speak Chinese. From his perspective, government employees had the “highest levels of knowledge and culture” in Uyghur society, and as such they had “immeasurable social influence.” It was therefore up to them to demonstrate what it meant to be patriotic Uyghur citizens. “Speaking the ‘language of the country’ should be the minimum requirement for patriotism,” he wrote. Chinese was no longer the language of Han people, but the language of reeducated patriotic Uyghurs. A short documentary on rural Uyghur life in the county where Memtimin Ubul works as Party official. The documentary demonstrates the richness of Uyghur rural traditions before the mass detention of Uyghurs and the rise of new forms of “patriotism” across the Uyghur homeland. From the perspective of state authorities such as Memtimin, learning the “national language” (国语 guóyǔ; Uy: dolet tili), which had previously been known as “the Han language” (汉语 hànyǔ; Uy: Hanzuche), was important for a number of reasons. First, and most importantly from Memtimin’s perspective, he said it aided the fight against religious extremism. By emphasizing Chinese as a test of patriotism, he argued that Uyghurs would “finally break free from the shackles of religion” — a statement that ignores the fact that millions of Chinese-speaking citizens, the Hui, remain devout Muslims. A second reason for embracing Chinese was that it would lead to a new kind of “cultural self-confidence” when it came to Uyghurs performing “Chinese traditional culture.” By embracing Han cultural traditions, Uyghurs would claim their Chineseness more fully. They would learn “basic quality” (基础素质 jīchǔ sùzhì), which he associated with Han cultural knowledge. This led to the third reason why Uyghurs should only speak Chinese: Doing so would allow them to “freely pursue a blessedly modern civilized life under the clear sky.” It would offer them a path to work in the Chinese economy. One example of a concrete benefit of embracing Chineseness: They would be able to interact with the hundreds of thousands of Han “relatives” who monitored their behavior, encouraged language learning, and provided them with modern conveniences. Memtimin wrote that through this process, many Uyghur farmers had been given advanced household appliances by the state, such as expensive multifunctional washing machines. Why, he wrote, do these machines sit “abandoned in the corner?” To his thinking, it was because the “farmers cannot understand the Chinese character manual,” a statement that ignores the resentment that Uyghurs feel toward the Han “relatives” who occupy their homes and the way many view such appliances as machines that waste water. In general, Memtimin argued, learning Chinese would aid Uyghurs in the “poverty alleviation” that, according to a declaration from Xi Jinping, was to come by 2020. Chinese language learning would allow Uyghurs to fully embrace new lifestyles in government housing, in government-subsidized cottage industries, government-sponsored animal husbandry, and relocation to Han majority areas. The reason the detainees were in the prison camps in the first place was “to learn the national language, law, and skills,” as one state observer noted. “We have seen that some of the ‘students’ have been able to master more than 3,000 characters. Now they can read newspapers, they use very good pronunciation, and can talk to us fluently. According to state media, in rural Uyghur areas there is now a Chinese language learning fervor. As the Xinjiang Daily noted, Uyghur children are now teaching their grandparents how to speak with correct tones. On three occasions, Memtimin slipped up and called Chinese the “Han language” (汉语 hànyǔ). In most references though, he remembered to refer to it the “national language” (国语 guóyǔ). This term, or the terms “common language” (sometimes referred to as 普通话 pǔtōnghuà, i.e., Mandarin) or the “common language of the country” (国家通用语言 guójiā tōngyòng yǔyán), became the preferred terms only in the past four years, since the beginning of the “People’s War on Terror.” Prior to this, Chinese was referred to almost exclusively as the language of Han people in Uyghur speech (Uy: Hanzuche). Now, though, Chinese is the language of the nation, the language of patriotism. According to Memtimin, Uyghur knowledge is degraded knowledge steeped in Islam. 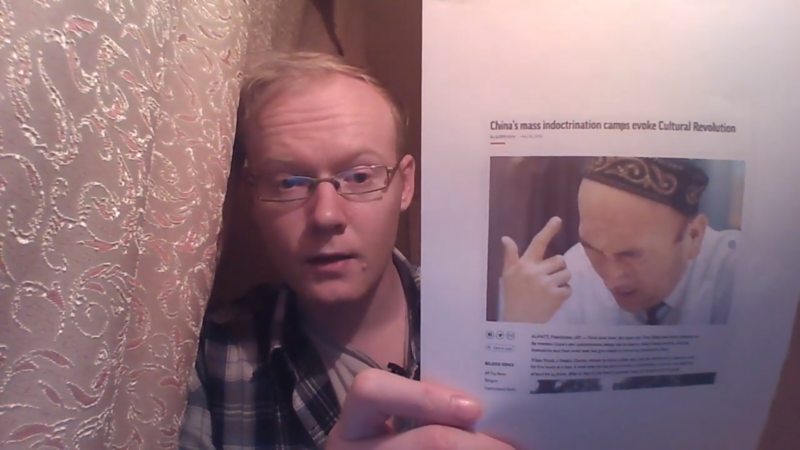 It means not only that Uyghurs are less than the “outstanding” Han, but also that they will forever remain “shackled” to a religion that state authorities have come to view as a “mental illness.” From this perspective, excising Uyghur language from their minds is the only way to fully access Chinese patriotism. This is the kind of patriotism that will keep Uyghurs out of the prison camps. 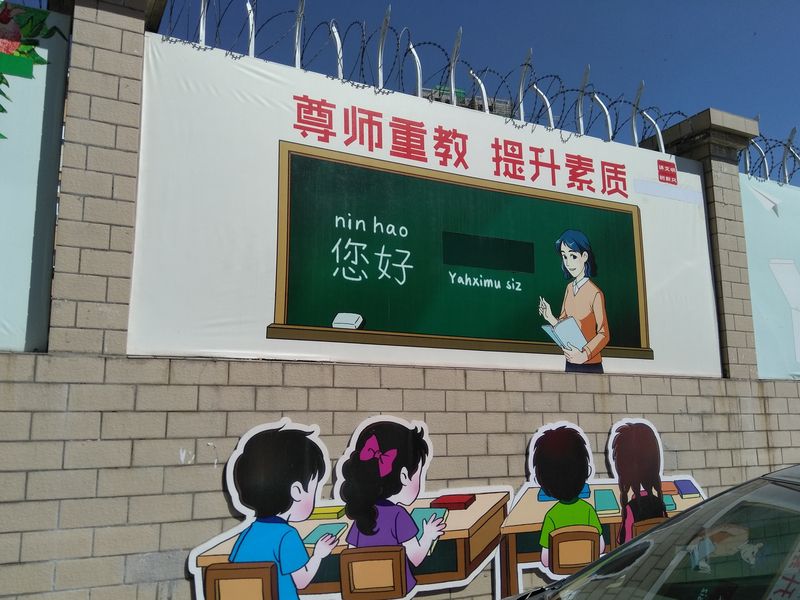 In Xinjiang, Chinese is increasingly the only permitted language. This purging of language publicly began with Arabic. The most notable way this was done was through the elimination of the common Arabic greeting “Peace be unto you.” Then the state eliminated Arabic-sounding names. Then they erased the Arabic in restaurant signage and mosques. Now, Uyghur script is being erased from street signs and wall murals. Memtimin’s essay is an example of the way Uyghurs have been compelled to profess “vows of loyalty” (发声亮剑 fāshēng liàngjiàn; Uy: ipade bildürüsh) to the state. These statements force Uyghurs to articulate views that are often not their own. The statements ask them to re-narrate their personal biographies in a way that emphasizes undying loyalty to the state. They strongly resembled the personal statements that many were forced to publicly declare during the waves of Maoist class struggle and thought reform in the 1950s, but in this case they are directed only at Uyghur ways of life and directly oriented toward Han state culture. In the language of a totalitarian regime, Uyghur “patriotism” now requires the active disavowal of the Uyghur way of life. In the Uyghur homeland, political speech and writing has become the defense of the indefensible. Vague euphemisms like “patriotism,” “harmony,” “stability,” “vocational training,” and “poverty elimination” gaslight the erasure of a native system of knowledge and the basic elements that make Uyghur life Uyghur: language, religion, and culture. Even Uyghur family life is threatened by a state that actively separates children from their parents or forbids parents from teaching their children significant elements of what it means to be a Turkic Muslim. In a process similar to North American attempts to eliminate Native American language, faith, and culture in the 19th and 20th centuries, the Chinese state is now asking Uyghurs to claim new forms of Chineseness and reject their own traditions. The language of “patriotism” and other vague euphemisms allows state authorities to name their priorities without conveying an image of violence — the one they are exacting. This article first appeared in SupChina on January 2, 2019.